Ah, Accept. One of oldest active heavy metal bands in history shows here, for the third time, that they still have it after 40 years of activity -- activity that included multiple breakups and the replacement of their legendary singer. The sound is tight, the songwriting is mostly a throwback to their 80s days, and the throat-shredding vocals of Mark Tornillo are a more than adequate replacement for Udo Dirkschneider. If you haven't gotten Blind Rage yet, maybe this criminally late review of it ought to convince you. It sounds new while still channeling the spirit of the old Accept lineup, and I can't see any reason why fans wouldn't like this one. The album starts almost symphonically with Stampede, which quickly moves to a fast-stepping beat of heaviness that ought to stir up the mosh pits they reference in the song. But I liked Dying Breed, a salute to their old-time metal contemporaries, even better. Tornillo's hoarse screams on here are fantastic, and the swinging beat and their usual thousand-man choruses make similarly excellent songs by followers like Iron Savior sound like pale imitations by comparison. The ones that aren't quite as good to hear are the more balladic ones that would have been great in the 80s, but seem out of place nowadays even coming from a band whose heyday was in that decade, such as the mid-tempo Dark Side of My Heart or The Curse, though the latter does rise a bit above mediocrity with its heavy chords on the chorus. Trail of Tears, a double-timed speed metal track with plenty of harmonized guitars, and 200 Years, a dark prophecy of a human-free future after we wipe ourselves out, are both much more welcome. It seems to me that there's way more of a focus on current events in the lyrical contents of this album than in past ones, and sometimes having a band try to do that results in some pretty lame songs. But though some of the tracks are a little odd with so much lyrical content jammed in (Wanna Be Free suffers from mixing these lyrics with their thousand-man choruses, sounding rather dull as a result), most of them do fairly well here. 200 Years, as mentioned, is one of their successes here, and listening to the lyrics on Bloodbath Mastermind, I couldn't help thinking of some of the sickos in the past few years who shot up schools or bombed large gatherings of innocents. The subject matter isn't all negative, though; From the Ashes We Rise is tough and uplifting, in the vein of some of their hit 80s albums, and the mid-tempo beat serves as a great vehicle for Herman Frank and Wolf Hoffmann's two-guitar solos to take their time and get the melody right. At the end we get a nice closing track in the form of Final Journey, fast and smooth in melody with a solo cribbed from Edvard Grieg's Morning Mood and a beat and delivery by Tornillo that reminds me of late-80s Judas Priest. This is a nice solid album crafted along the same lines as Blood of the Nations and Stalingrad. 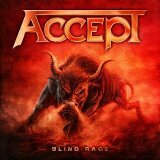 Accept aren't changing their formula much thus far, but who really wants them to do that at this point? What's wanted is heavy metal that can still get a crowd headbanging, and in this respect, Blind Rage delivers the goods.